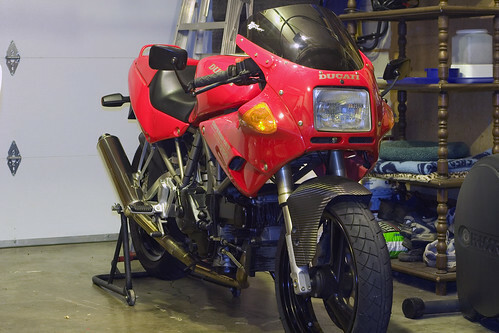 1997 Ducati 900 SS/SP: 348 Original Miles! An exceptional and unusual bike, in “as new” condition! 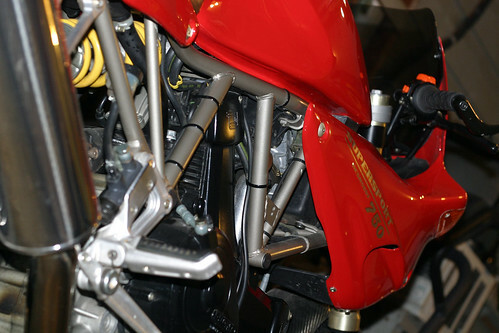 A limited-edition model of the Ducati Supersport line with many desirable modifications by its one previous owner. The list of up-graded equipment includes Termignoni carbon-fiber exhaust, STM racing “slipper” clutch, Ohlins fork kit, Ohlins shock kit, Ohlins steering damper, adjustable rear-set controls, Pilot Sport Michelin tires on Marchesini wheels, Kevlar-braided front and rear brake lines, carbon-fiber timing belt covers, racing (slotted) clutch cover, and Ducati ST clip-ons mounted on Ducati risers. This bike carries number plate “SP G42” of the limited edition SP series. It is certain to attract collector interest, and is ready to provide many miles and many years of exciting riding to its next owner. If you have the experience and the sensibility to appreciate a bike which has been refined and improved to its ultimate expression, this may be the one for you! The auction ends in 7 days and it’s already up to $9350, reserve not met. Considering the SS/SP’s trade hands in the $5-8k range most days, this one is already showing it’s low mileage value — especially considering it’s not even a Superlight, and it’s modified. Seems to demonstrate the quality of the modifications chosen, low mileage, and rare color. Author DanPosted on August 26, 2007 March 9, 2008 Categories Automotive, Classifieds of Interest, MotorcyclesTags Ducati, red2 Comments on 1997 Ducati 900 SS/SP: 348 Original Miles! One more Gray Market bike for good measure. But this one has a legit Oregon title, which will make it much easier to use on any given Sunday – but on public roads as well! 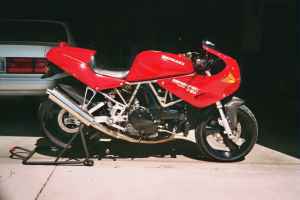 The ad is on Google for this NSR250 and includes links to a forum page with pictures. It’s been some time since it’s seen an update from the owner, but I suspect he got lots of tire-kicker responses. A bike like this won’t move overnight. But at $7800, it’s priced right. $28k 1999 Yamaha R7 For Sale. The are RARE! Most were turned into race bikes immediately. 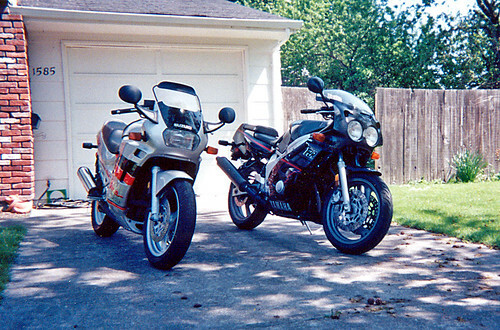 $6k 1996 Honda RVF400 For Sale, and a GSX-R 400RR! A one stop shop for an ethusiast that just hit the powerball — here’s hoping my numbers come up! Only sold in the U.S. for one year, there’s probably less than 150 of them in the country. And one of them is in my garage! DucatiSuite – A great collection of illustrated how-to articles for Ducati’s. Everything from changing oil to valve adjustments! I’ve already got a post started about this new aquisition, one I had started to write before I had even purchased the new bike. 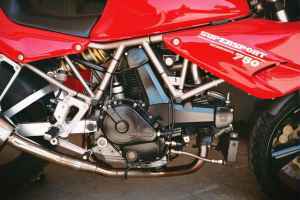 The title: 1993 Ducati 750 SuperSport: Diagnosis Priapism. A bold title, but I was already in love and I knew the title would be befitting the new steed once in my possession. And then it happened of course. I sprained my knee within minutes of ownership and I would have to just soak in the lines and construction of the new bike in the confines of the garage as my knee healed. So much anticipation built up, just to have a mishap sideline me into a sentance that would nearly drive me mad! Naturally it was only a few days before I was invited down to take a look up close and try out his new bike. It has been probably 6 years or more since I rode regularly, so I was a bit anxious about dropping his new bike. But sure enough it comes back just like riding a bicycle. And I loved every minute of it. Before I knew it, my 15 minutes was already up. I suspected a bike was back in my future when Paul started shopping, and this just accelerated the search. As the previous owner of a Yamaha FZR600, I knew I wanted another supersport machine. I started by looking at the latest evolution of the FZR600, the Yahama YZF600-R6 and the Honda CBR600F4i. Both bikes are technologically more advanced than my old machine with features like fuel injection, all aluminum frames, and 16k+ RPM redlines. I made a budget of $7k for the bike and all new gear. This would put me in the market for a 2000-2003 model with about $1k left over for gear. One of the things to be mindful of when buying a supersport motorcycle is that it’s pretty likely the machine hasn’t seen easy miles. Not to say that every example has been abused, but they are often owned by younger riders who don’t have either the appreciation or means to keep them nice. Luckily they’re also easy to spot. Numerous cosmetic tack-on’s, aftermarket performance parts for a rider with only a few years under his belt, and hardly ever as clean as they should be. So I made my decision early on to look for an older adult owner and as little modifications as possible. My first encoutner was with a 2005 F4i, 2 years newer than I thought I’d be able to afford. At $5700, all stock, and very low miles, it looked like a sure thing. I went down to check it out with Paul and my first impression was that of the owner who arrived to meet us in shorts, t-shirt and helmet. Not a good start. The bike itself was in fact low miles, but had seen very little maintenance and looked generally unloved with a dry chain and dirt/dust in every crevace. The bike did ride very well but had a disturbing vibration between 4-6k rpm. After walking away that afternoon and doing some internet research, I made this post about the cam chain tensioner that plagues many of these F4i’s. Even as the owner said he would drop the price to $5400, I knew this wasn’t ‘the one’ I was looking for. Then work got busier and some travel came up, and bike shopping was on hold. But in the meantime, Shana secured financing and accepted that a new bike was really in my future one way or another as it was pretty much the only thing I would talk about for the next few weeks. Shana has long been of theory that my nearly accident free 4 years on a bike in college had spent all of my good fortune and a return to riding would result in a crash. But I’m older now, and things really will be different this time around. Having spent time on a racetrack and witnessed many friends accidents in cars and bikes, I have a greater appriciation for what could happen. And I’m determined to do my best to be a safe and responsible rider. When I met the owner on that Saturday, the bike was exactly what I was looking for: Adult owned, well looked after, low miles, and needed nothing with an ad that stated new tires, battery, and recent maintenance. Furthermore, it had some choice upgrade components: K&N air filter, Staintuned 2-1 header exhaust combo, and the holy grail of racing carbs, Keihin flat slide carbs. BUT, and there had to be a BUT of course, the oil cooler line decided to spring a leak and needed to be replaced. This would also prevent me from getting in a test ride or even hearing the motor run for more than 1 second. But I was already sure, this was the one and it would be worth the wait. I came back out a few days later and while the new oil cooler line was now in, the ‘new’ battery from last year had never been used or charged and wasn’t holding a charge. So now a new, new battery was in order. But that would need to charge overnight. AGHHH! It was driving me crazy, but I was really getting my first taste of the well documented Italian tempremental nature of Ducati’s. But then Friday arrived. It was dusk on a beautifully sunny day and when I arrived, the bike was running with no issue. I took my test ride and all was right in the world after a week of incredible anticipation. I handed over the check shook hands and headed to the gas station to fill up the tank and put air in the tires before heading out into the countryside to see the sunset on my new bike. Beaming with joy, I hammed it up with the gas station attendant and gloated over my new purchase. After filling up with super, the air pump was behind me, so I’d need to turn around between the pump islands. And this is where my early Christmas day ended terribly early. I had been warned about the steering, but naturally was too caught up in the moment to really hear the words as strongly as I needed to. There is no steering on this bike really and all the turning is done with leaning. So I slipped out the clutch made a little lean to initiate the turn and then turned the bars into my turn. All pretty textbook. EXCEPT, I hit the limit of the steering with nearly no speed accumulated and the bike stopped moving. When the bike isn’t moving, you can’t be leaned over. The bike will fall over and there it goes. I put my right foot out and caught the bike but it was too far over to catch completely. I was able to gently set her down, but then had to jump off and pick the bike back up. Words cannot describe how embarrassed I was. My pride was reduced to nil in a matter of seconds. After I got the bike upright, I felt an ever so slight pain in my knee and since the carbs were now flooded, I needed to take a timeout anyway. As I waited, the pain in my knee grew. I tried to ignore it, but thought the better of it, and after I filled the tires, I went straight home — where my wife was waiting. Of all things after my first ride, back on a bike after at least 7 years, reporting that I had already tipped it over wasn’t high on my list. So I briefly thought of not mentioning it, but as soon as I pulled in and got off the bike, I couldn’t put my weight on my knee. Nope, no hiding this. DAMN IT ALL! The good news is that the bike is undamaged. The bad news is that it’s not damaged because my knee took that weight, and is a bit damaged. After two weeks I’m nearly healed. But really, it was my ego that took the biggest beating. And even that is coming around lol. I have since taken the bike out twice on 25 miles rides and it’s a wonderful. It does need the carbs synced, so riding through town is an exercise in bucking and sputtering (although it does shoot a foot long flame out the back between shifts Paul tells me). But once on an open road with proper revs, it pulls great and only requires the mere thought of turning to initiate the turn. No wonder Ducatisti’s are such passionate people concerning their rides. I’m planning on getting the carbs rebuilt and sync’d, as well as taking the well reviewed Team Oregon motorcycle training in September to help me get up to speed after being away from the sport for so long. So things didn’t go exactly as planned, but it’s all going to work out in the end. Paul and I are already planning a long ride to California 🙂 Ed, are you sure there’s no bike in your future this year? !